Directorate General of Central Government Health Scheme has published the new and fresh empanelled Hospitals and Diagnostic centres with revised package rates with effect November 2014. 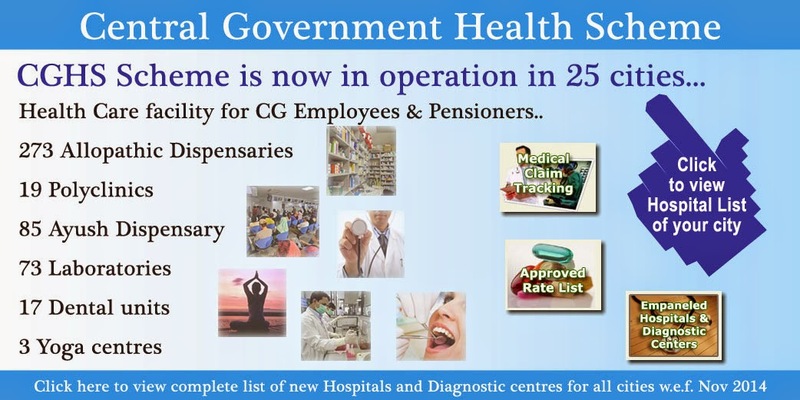 The “Central Government Health Scheme” (CGHS) provides comprehensive health care facilities for the Central Govt. employees and pensioners and their dependents residing in CGHS covered cities. Started in New Delhi in 1954, Central Govt. Health Scheme is now in operation in 25 cities in overall India. shimla mai hai iska hospital????? Issue notification containing detail of CGHS Hospitals/Labs in Jammu. How many different Government rules exists in CGHS regional offices across India? Nice Post. Find out list of Best Master health checkup centres in Bangalore for Lab Tests, Blood Tests, X Ray, Ultrasound, ECG, TMT, CT, MRI, Mammography, Thyroid Tests, Liver Tests, Kidney Tests etc. Thank your for sharing all the list of hospital.